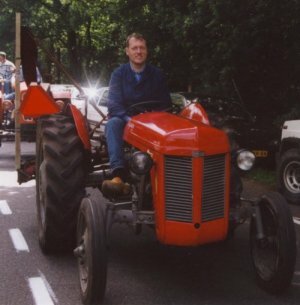 This is the tractor Internet site of Gerrit Preuter. In daily living I work at ASML as a constructeur within the Elektronic development department. Recently a boys dream of me came out. An own tractor. Because I have grown up on a farm where it has been always worked with Massey Ferguson tractors (and still working), it had to become of course an old (Massey) Ferguson. My brother has already Massey Ferguson 35 for a long time. At a time he told me that he had spotted a Ferguson TEF at a dealer in a good condition. Unfortunately it took almost 2 months before I found time to go to that dealer. On Saturday 27 May 2000 am I will look at. It was love at first sight. Unfortunately she could no longer start. It was drag and immediately started. Therefore I immediately settle up and to drive the tractor to the farm of my parents. There she had to stand and wait till I found space for her at the neigbourhoud of my house. Since august 2002 she has stood in end courts in a garage. I hope that the restoration work now goes what more rapidly. In the meantime the maintenance of this Internet site has become a substantial part of the hobby. For this reason I shall also try to extend the Internet site.